Congratulations to the Cast, Crew and Band of Guys and Dolls for their amazing performances last weekend and this weekend! You have made CCHS proud! 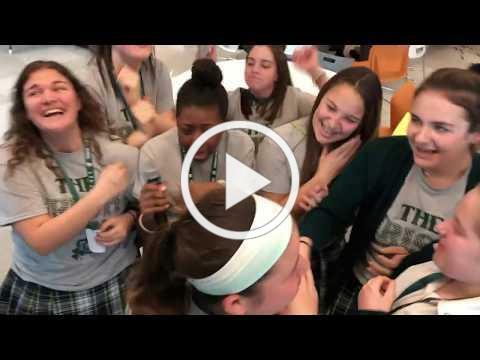 Thank you to Mr. Bruckner and Isaac Chang for creating this highlight video of all of the #IGD2019 fun on Friday! Verification of Christian service hours for the first semester were due December 10, 2018. As a reminder Christian service is an annual school requirement and students will not be eligible to participate fully in other extracurricular activities and events if they have not fulfilled their service obligations. Our Spring KAIROS VI retreat will be held March 28-31st at the Diocese of Camden Kairos retreat house on the property of Holy Spirit High School in Absecon NJ. This retreat is open to juniors and seniors and the cost is $195.00 for the four day, three night retreat. KAIROS means "right time" meaning God's time and is a powerful retreat experience for young people to step away from every day demands and reflect on their relationship with Christ and others. Students who signed up received paperwork for the retreat this past week and parent received a Renweb message as well and parents were sent an important email. It is important that all paperwork for Kairos is submitted by March 18th so final coordination can be made with the retreat house and food services. Mr. Henderson the junior moderator will be distributing prom information on Tuesday, March 12th to the junior class.